Uncommon Garden and Gifts – Johntheplantman's stories, musings, and gardening. 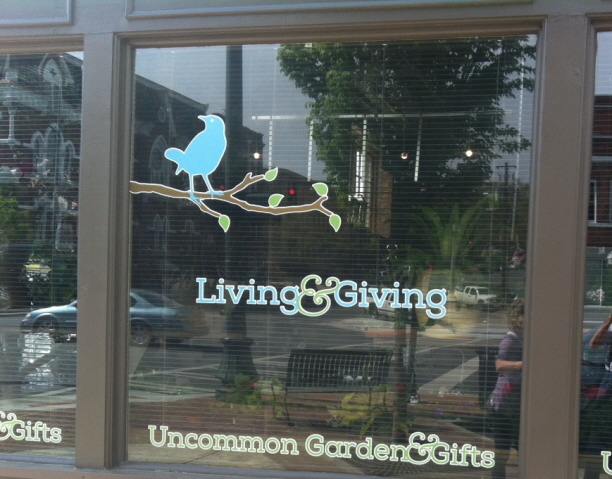 On Monday, April 14, Living and Giving will open at its new location on the corner of Broad Streetand Fourth Avenue in beautiful downtown Rome, Georgia. 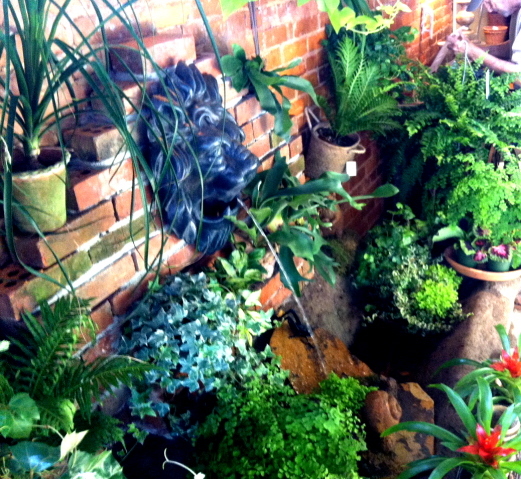 Aside from the fact that the plant and gift items are appealing and well-chosen, and not considering the beautiful smiles that accompany the attentive help and service, I just love Living and Giving for the displays. 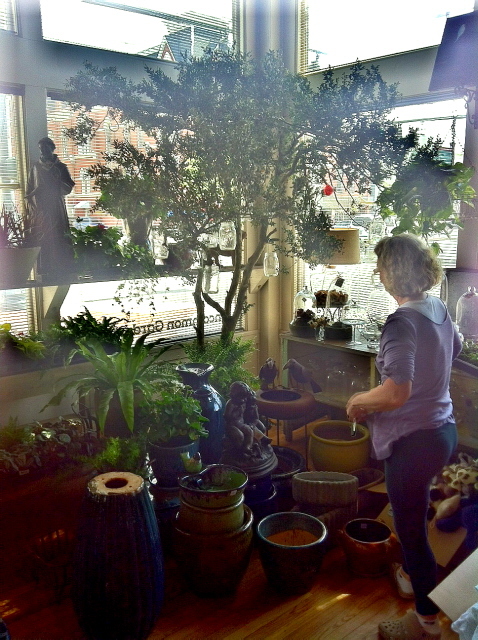 The shop owner, Lisa Landry is a true display artist and the shop is her canvas. I was delighted when Lisa asked me to help with a couple of projects related to moving the store down the street. I have documented progress that you may see by clicking HERE(March 16) , HERE(March 23), and HERE (April 6). I stopped in a couple of days early to check out the progress. There was a sign on the door that nicely said, “Leave me alone, I’m doing my creative thing.” (Those are not the exact words, but that was the perceived meaning). I found Lisa working at the front counter. I was greeted warmly and Lisa guided me back to her “plant area” which was developed around the fountain that we had built a couple of weeks before. I was pleased with the transformation. 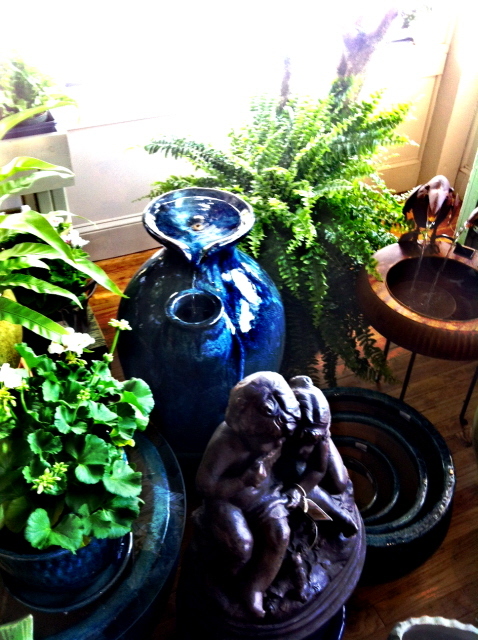 When we first installed the fountain the water falling was too loud. If you look closely at the picture below you can see a piece of brown slate placed so that it will break up the water fall and reduce the sound volume. 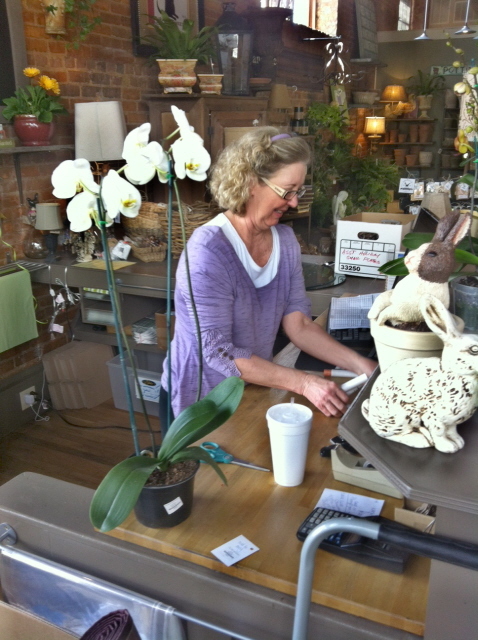 Lisa had told me before that customers liked to come in and pick out a plant and then a pot to put it in. 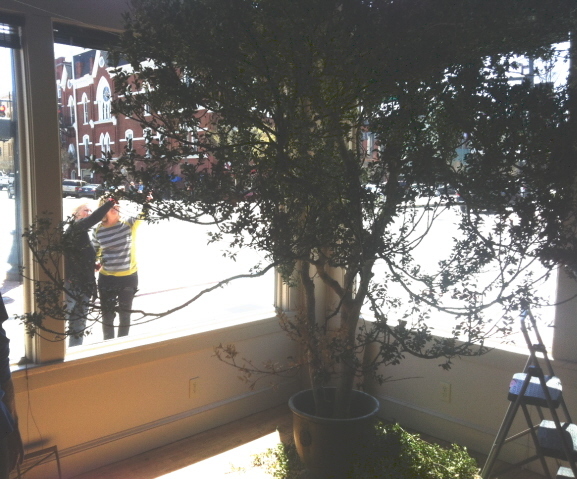 There is always someone available at the store to repot a plant in an artistic manner. 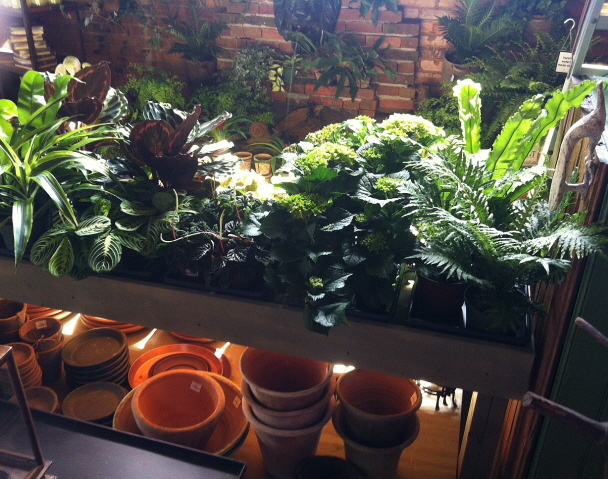 I found a table of plants basking in the light from a high window with a tray of pots below it. Lisa was tickled with the logo and artwork on the front window and she took me outside to check it out. I think Monica Sheppard did a wonderful job of conceptualizing and illustrating the store’s message. The boxwood display ended up looking like this. And she’s not finished yet. I liked the blue fountain which made a subtle, muted sound. Decorating with sound and color. I asked Lisa if she needed any help moving things and she said, “I just want to be left alone to do my thing.” I decided it was time for me to leave. 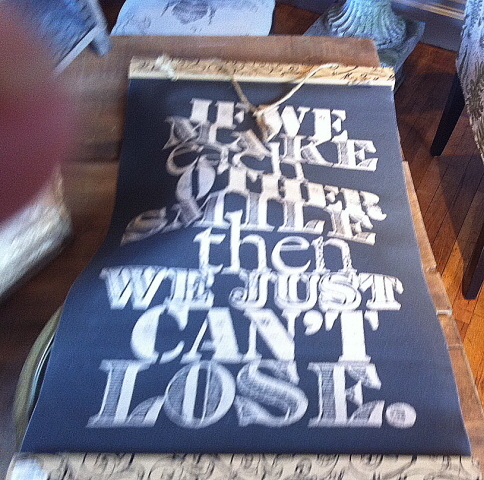 I smiled as I passed a sign that was waiting to be hung. As usual, I would just love for you click here to go to Amazon and purchase the ebook edition of my wonderful book, Requiem for a Redneck to go on your Kindle. I have also noticed that Amazon now has a free Kindle app for iphones and tablets. Is that cool or what? usual, I would just love for you click here to go to Amazon and purchase the ebook edition of my wonderful book, Requiem for a Redneck to go on your Kindle. I have also noticed that Amazon now has a free Kindle app for iphones and tablets. Is that cool or what? 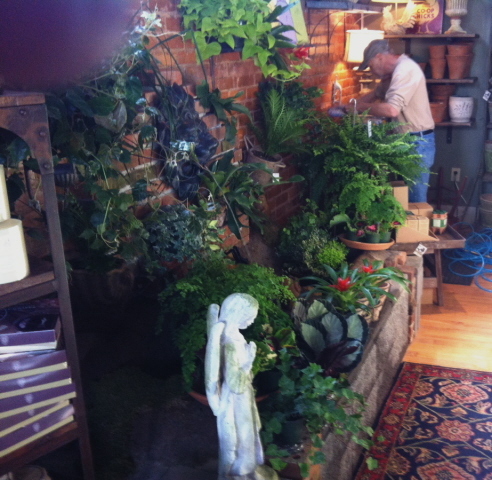 Pingback: Living and Giving-more than a plant shop-in Rome, Ga. | Johntheplantman's stories, musings, and gardening.